If you do not run then you must cheer. Such is the mantra at Run Dem Crew, a London family of creative heads who run marathons led by their mentor and crew-founder Charlie Dark. Last Sunday I spent the day cheering on runners in the Brighton Marathon, and with the Virgin London Marathon about to drop this weekend, I wanted to try to capture what Cheer Dem Crew is about for those who might be new to it. 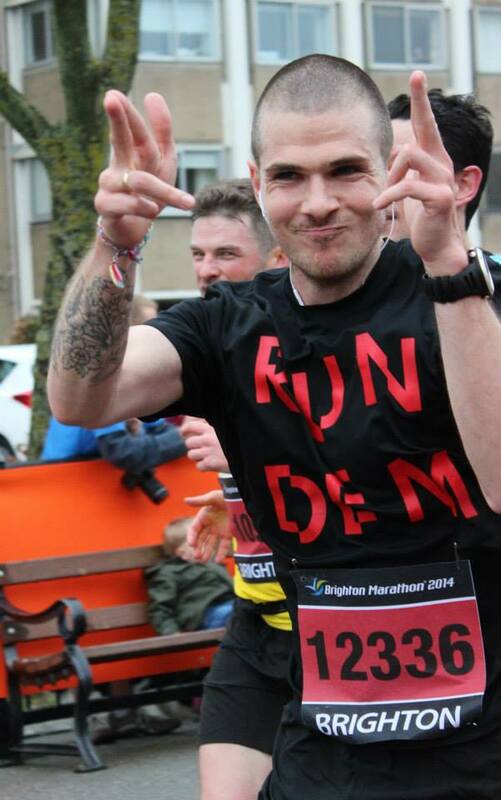 Sunday April 6th was the date of the Brighton Marathon. 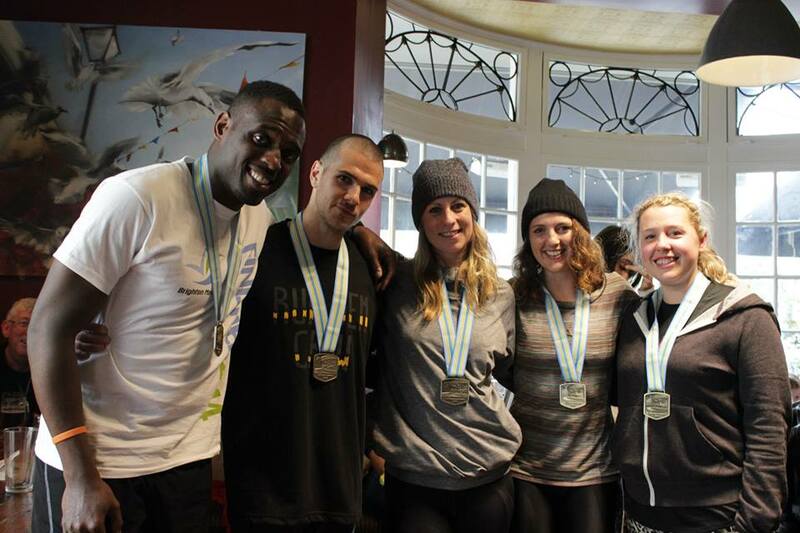 It had been in my diary for some time, as several friends in Run Dem Crew were running it, raising money for good causes including the Teenage Cancer Trust. 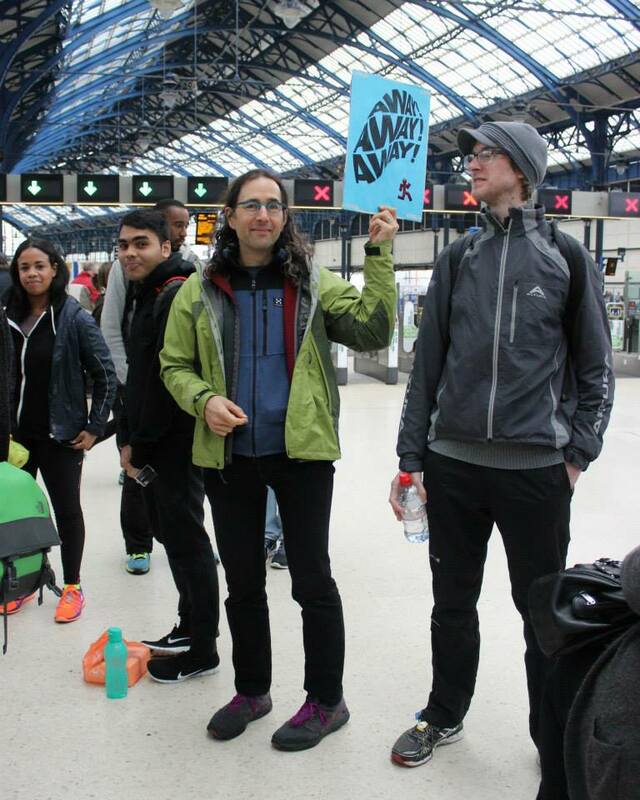 Paul Bains and Claire McGonegle had gone to great trouble to take care of the logistics of getting over 20 of us to and from Brighton, choosing the best spots to cheer from, and booking a pub for drinks and food afterwards. I was up before 7.00 and met the crew at St Pancras Station at 8.15. Paul had organised group-save tickets, so we paid just £5 each to travel to Brighton and back. It was good to see familiar faces and to meet some new ones. Two of the crew had hardly slept after big nights out, but you would never have known it from the enthusiasm they showed all day. The train journey was full of jokes, interspersed with checking the progress of our runners in Brighton and Paris on the race apps. Danny Wood was smashing it, coming through the first 10K in 41 minutes. All our runners looked strong, and we were eager to catch up with them in person. Once we reached Brighton, we had a fair walk to the first cheer spot. I was excited to be back in town as I lived there for 3 years while at the University of Sussex. As the seafront swung into view we could see the runners streaming past. Paul had identified a good cheer spot that the runners would pass at Mile 14 and then again at Mile 18, where things often start to get difficult. We’d brought with us four large Run Dem banners, and were quick to get them set up. Glancing at the app, we realised we’d missed Danny Wood through Mile 14, so some of use positioned ourselves on the other side of the road to make sure we caught him at Mile 18. We’d just gotten settled when suddenly Emily Ackner came through Mile 14 looking incredibly strong. At this point, Cheer Dem erupted in the first of many explosions of noise, high-fives, whoops and cheers. Emily’s face lit up and it was hugs and gunfinger celebrations all the way before she sped off. Next was Nathaniel, just a couple of minutes behind, and from then on in it was non-stop shouting and cheering. 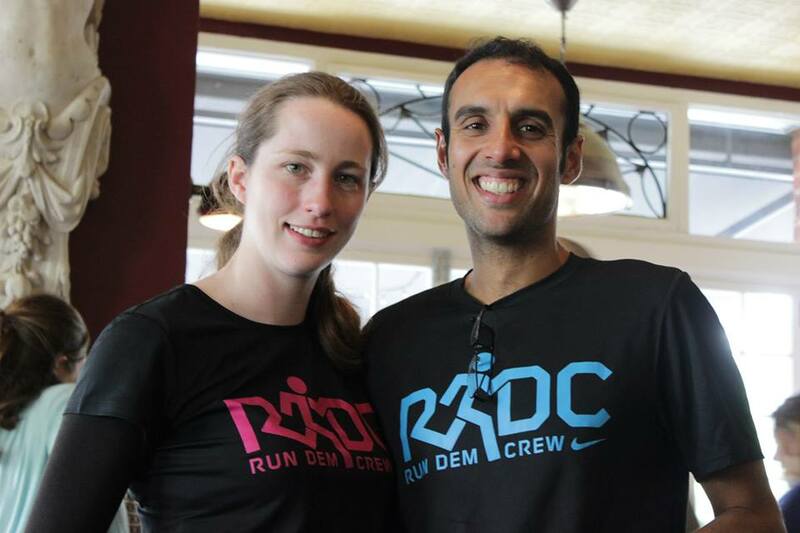 At Run Dem, we don’t just cheer our own runners. 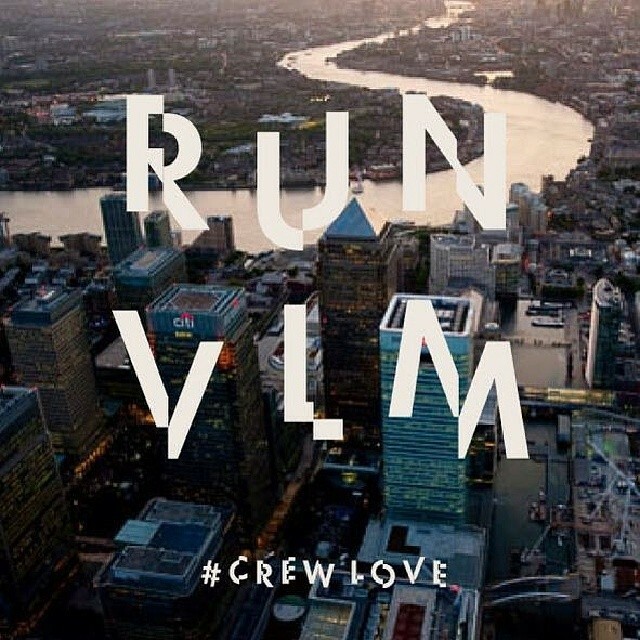 Anyone on the course gets a healthy dose of crewlove. To add to the voices, we had whistles, a cow-bell and high-fives. Soon Danny came powering through at Mile 18, looking like an absolute don, completely in control. Once Emily Ledbrooke and Deborah had come through Mile 14, all of the crew switched to the other side of the road to catch our runners at Mile 18. We stayed there till every crew-member had come through, as at Run Dem, no one is ever left behind. Our final cheer spot was just a short walk away on the seafront at Mile 24. At this point, many runners were reduced to walking, and cheering can really make a difference. One member of the crew was almost overcome with emotion when they passed through, and Paul Bains ran a little of the way with them to make sure they were ok. Some of the cheer crew were already beginning to lose their voices, but we continued shouting and cheering for all our worth. As Deborah from the crew approached, Jason and I decided to tunnel up on the course for her. This is a Tuesday night crew tradition: when we reach the mid-point of our runs, the first group to finish forms a human tunnel for the next group to run through, and so on, creating a tunnel of noise and good vibes. The course wasn’t too crowded at this point, so we hastily got one together for Debs to run through. This may be the first time this has ever happened during a race, and I hope we can continue it when the course isn’t too congested this Sunday at VLM. Finally, after almost three hours solid cheering, our work was done. We assembled for the traditional crew photo and headed off to get food at the North Laine pub. Props to Claire for organising an excellent post-run venue and meal. 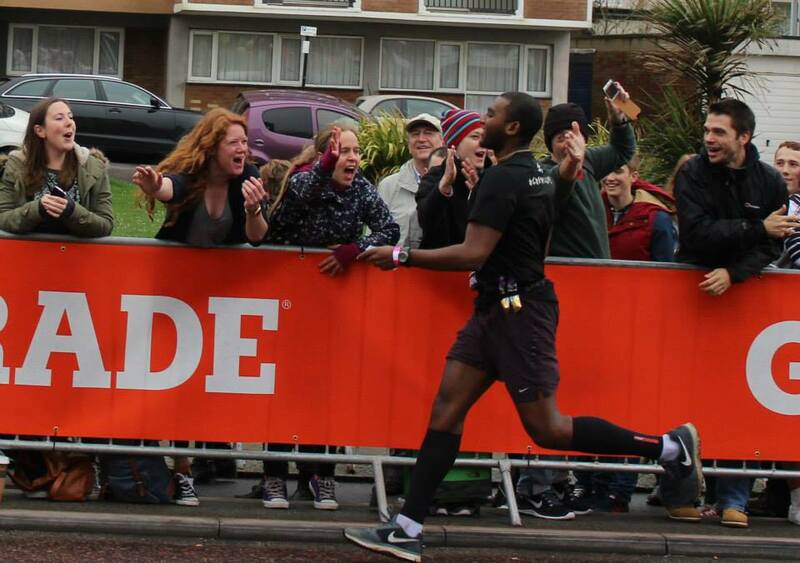 As each runner from the crew arrived, they were treated to a hero’s welcome, to the surprise of the other punters. The endorphins were flowing as freely as the ale while we shared photos taken on the course and hugged and congratulated our friends. A good non-running friend of mine who lives in Brighton came to join us for lunch, and she was so inspired by what she saw that she has bought a pair of trainers and signed up to do Parkrun this weekend. The journey back was full of weary fun. I really enjoyed getting to know some of the newer crew-members better, and eventually we rumbled back into St Pancras and Jason and I got the bus back to N16 together. Getting off the bus outside my home, I went into a shop and bought a Mars bar. When I opened the Mars bar I found out I’d won another Mars bar, which just about sums up an awesome day. 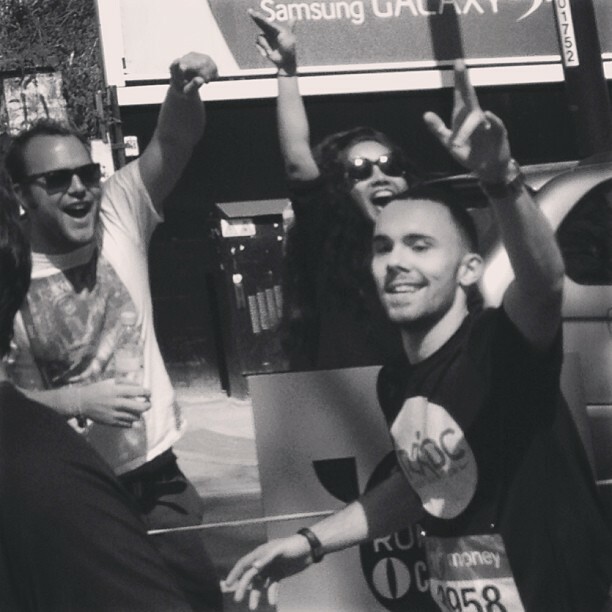 Supporting other people running marathons is one of the most rewarding things you can do. You get back what you put in tenfold. Words can’t express the transformation in a runner who has been broken and is walking, locked in their own internal mental struggle, when they hear you shouting their name. I lost count of the number of times on Sunday these lost, troubled souls looked up, made eye contact and were transformed by the strength of human warmth directed towards them from the crew. In today’s modern, fractured society, the sense of goodwill that is shared on a marathon course is increasingly rare and precious. Many people running marathons are doing so in memory of loved ones who have died and it’s all too easy to become caught up in the burden of feeling you are letting someone living or dead down if you’re struggling to complete your race. But that’s why the marathon is such an inspirational distance. 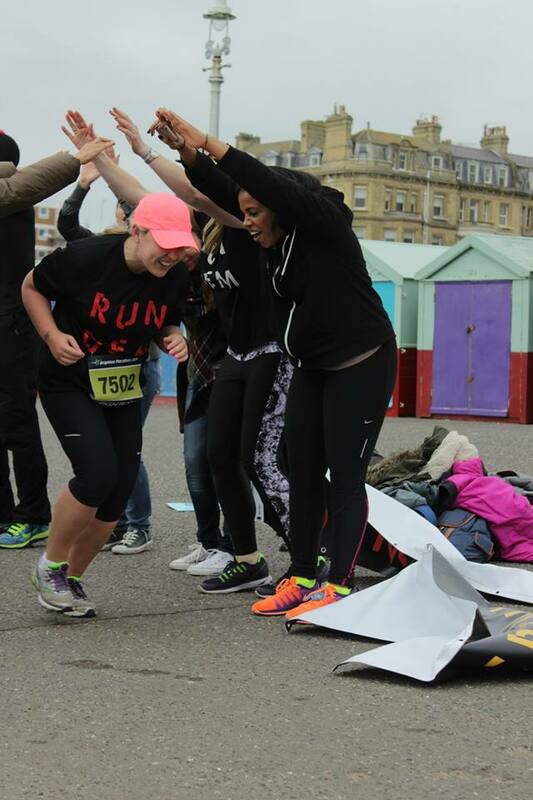 It takes you beyond the limit of human endurance and then asks “What have you got?” Cheer Dem Crew is as much about making sure that no runner has to go through their struggle alone as it is about celebrating the triumphs of those smashing their way to PBs. All of which brings me to the plans for this weekend. 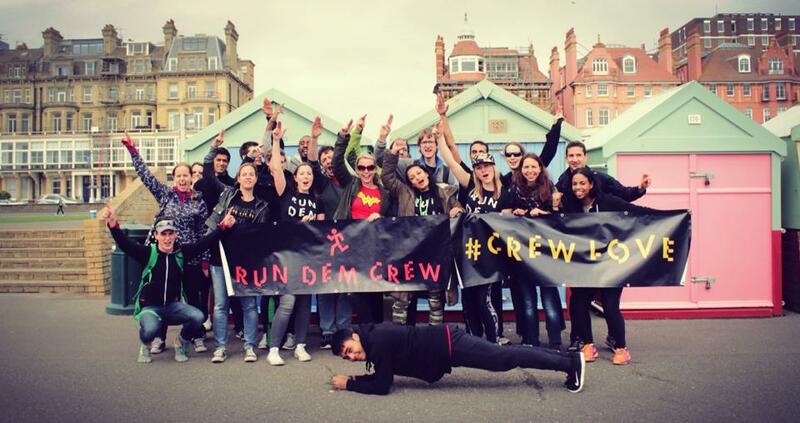 Cheer Dem Crew will be based at Mile 21 of the London Marathon course, cheering on Mo Farah in his bid to win the race, all of the crew, and every single runner that comes through. 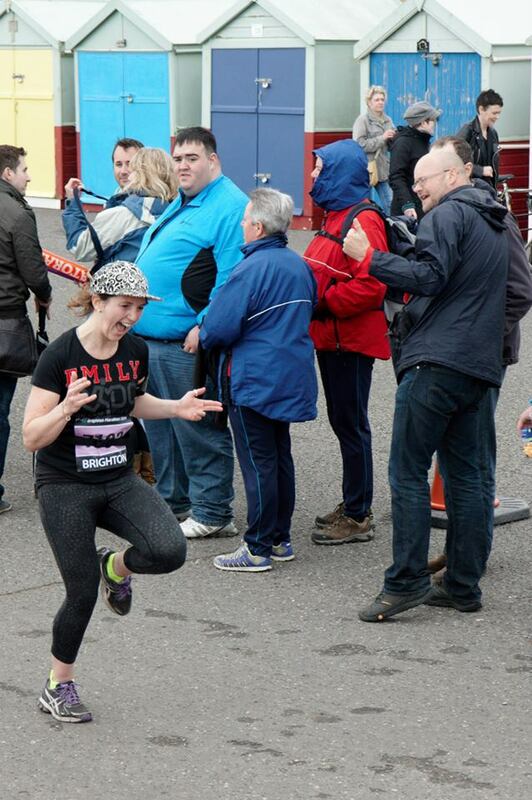 We base ourselves at Mile 21 because that is traditionally where runners hit the wall. There will be over a hundred of us bringing phenomenal vibes to that section of the course and I can’t wait. Check out mile21.co.uk to see what went down last year, and to follow remotely on the day if you can’t make it personally, as the feed will be updated in real-time. There will be a sign-making, fund-raising session taking place at Shutterbug in Shoreditch from noon this Saturday, so come down if you can to help prepare banners and personalised signs for our runners. Later on the Saturday Night Ninja Crew will be putting the signs up on the route pre-race. This has to be done late enough in the day that they won’t be taken down again. Then on race day Cheer Dem Crew will convene at Docklands Tyres and Exhausts, 767 Commercial Road, E14 7HG. It’s just before Mile 21. Come early and be prepared to lose your voice, shed some tears and feel goosebumps as the adrenaline takes you on a rollercoaster of emotions almost intense as running the race itself. Virgin London Marathon this week is gonna be insane, jubilant, emotional. It will be the ultimate manifestation of #crewlove in 2014. If you’re running, as Charlie says, you’ve done the hard work in training, so the race is going to be a celebration. For those not running, this is a great chance to give back a small portion of what we get from being in the crew. Bring it on.